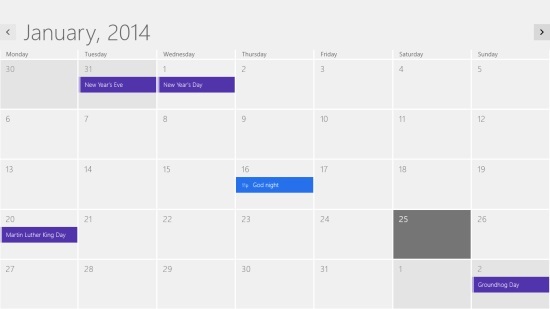 Here are 4 free Windows 8 Calendar apps to help you keep yourself organised in an easy way. Whether in office or at home, we all use a calendar very often in our lives to check dates, holidays, plan important events and more. For all those who work on their Windows 8 PC, Windows Store offers many useful free calendar apps which you can use to manage your events and assignments. These Windows 8 calendar apps are easy to use and have wonderful features. You can set reminders, mark appointments, and add messages. You can pin the important months to your start screen. Some of these Windows 8 calendar apps give you freedom to customise the design. 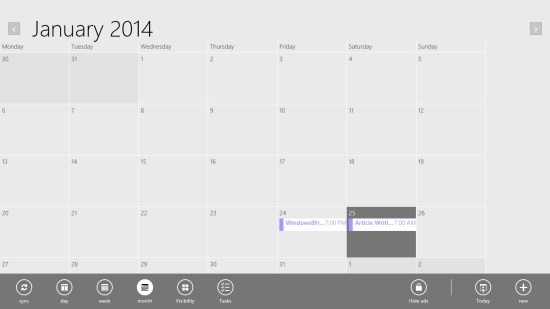 You can also set the calendar as a live tile on the start screen of your Windows 8 system. The calendar apps that we are going to review today are Calendar Live Tile, Gmail Calendar, Birthday Social Calendar, and Windows 8 Calendar. The first three Windows 8 calendar apps can be availed freely from Windows Store, while the fourth one is Windows 8 default calendar app. With the help of these Windows 8 calendar apps, you can easily plan your days and manage events. Let’s have a detailed look at each of these calendar apps. Calendar Live Tile is a free Windows 8 calendar app that lets you set a live tile calendar on the start screen of your Windows 8 system. The app generates entire month’s view as a live tile on your start screen. The unique feature of this app is that you can easily customize the size, font, lines, and color theme of the app, and give the desired look to your calendar. As you customise the settings, you will also be able to see the preview of the calendar tile in different sizes. You can also pin multiple calendar tiles for various months on your start screen. This saves you from the trouble of opening the app every time you wish to switch to various months. 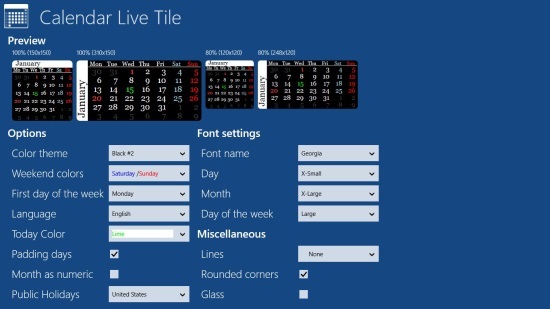 Calendar Live Tile is freely available under Tools category of Windows Store. Click here to get Calendar Live Tile. Gmail Calendar is another free Windows 8 calendar that synchronizes with your gmail account calendar and keeps you notified of any events that you have marked on it. Apart from it, you can also add, delete, or edit events or appointments directly in this app. The app gives live tile updates of the current date and day on the start screen of your Windows 8 system. The events that you mark on this calendar and the ones on your Gmail account calendar are also displayed along, on the live tile. Like many other Windows 8 calendar apps, this app is also capable of generating day’s view, week’s view and month’s view. Gmail Calendar is freely available under Productivity category of Windows Store. Click here to get Gmail Calendar. Birthday Social Calendar app is a special kind of free Windows 8 calendar app that reminds you of all your friends’ upcoming birthdays. One thing you have to keep in mind is that the apps will work for you only if you have a Facebook account. This is because the app directly connects with your Facebook account and imports all your friends from there. As you click on the app’s tile on your start screen, it will show you birthdays of all your facebook friends, categorized month wise. Birthday Social Calendar app also offers to set reminders for a specific time that will notify you of the birthdays of your loved ones. So, with this app, you will not forget birthdays anymore! 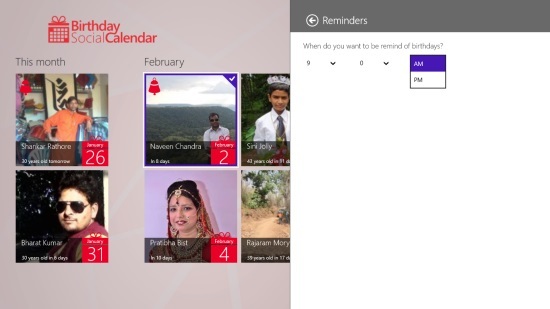 Birthday Social Calendar is freely available in Social category of Windows Store. Click here to get Birthday Social Calendar. Windows 8 Calendar is the default Windows 8 calendar that lets you see a full screen view of the calendar on your Windows 8 system. You can schedule appointments, set reminders, add messages and blog posts to your calendar. You can even send invites via e-mail. The calendar app also lets to see all the listed holidays. This free Windows 8 calendar app has a beautiful layout. The full screen mode makes it easy to view the scheduled appointments and other tasks clearly. These were some of the useful Windows 8 calendar apps we have found. Try these and make your life more organised. Do share your feedback via comments.